The Pagan Files: Is Prince Philip a god? Such is the revered status the Duke holds among the 400 tribespeople that, as their chickens scratch the dirt, they speak of him with the kind of devotion Catholics reserve for the Virgin Mary. 'We are waiting for him to return to us,' says white-haired Jack Naiva, the aged tribal chief, who thinks the Prince's 85th birthday, a week today, would be the perfect opportunity. Now, while this might seem to be jungle mumbo-jumbo to the outside 'civilised' world, the fact is that Prince Philip has officially accepted his revered role within this remote tribe, which hunts wild pigs with bows and arrows and cooks on hot stones in the ground. The proof of this remarkable relationship is three autographed photographs which Philip has discreetly sent to the tribe, and in the letters that have flowed between his staff and old chief Jack. The most surprising photo, which Chief Jack and his people continue to worship, shows the Duke holding a traditional war club — a nal-nal — which was sent to Buckingham Palace in the 1970s. The Yaohnanens requested only one thing in return for their gift: a picture of Prince Philip holding the weapon. Panic raced through the palace corridors. How on earth does one hold a nal-nal? Finally, a former British Resident F Commissioner from the islands came to the rescue and Prince Philip donned a smart morning suit and wandered out into the palace gardens to pose coming austerely for the photograph, which has, until today, remained out of the public eye. Ffrowned upon such a display. So the formal photo was taken and off it went to the wonderful world of witch doctors, warriors and cannibal descendants in the South Pacific. Chief Jack, who prefers not to talk about the cannibal days, keeps the photo in his hut, where he protects it as best he can from the humidity, occasionally bringing it out so the tribe can pay its respects. So strong has been the 10,000-mile relationship, and so determined has Buckingham Palace been to keep it under wraps, that a private secretary urged great secrecy in one official letter. However, we can reveal today the contents of a letter that John Champion, the British Resident Commissioner between 1975 and 1978, wrote to Buckingham Palace regarding what he described as a 'tall story' but one which was very real to the Tanna people. Mr Champion wrote, from his official residence in Port Vila — the capital of the New Hebrides, as Vanuatu was known in the 1970s — that a deity living in the volcano near the Yaohnanen village 'became a white man who went away to Britain to marry the Queen there'. Mr Champion added that the ideal gift to the tribal people would be to 'arrange for the return of HRH himself', with appropriate gifts, 'to live with them for ever. .. dressed, no doubt, in a nambas'. As this was clearly not an ideal solution, wrote Mr Champion, he advised that a very good return gift would be a signed photograph of HRH and a supply of tobacco pipes, 'which the elders could smoke in the long evenings . . . while discussing the affairs of their community over the ritual kava'. And so the first official photograph was sent to Tanna and presented with great ceremony by Mr Champion to the tribe. The second photo, of the prince with the war club, arrived several years later, just as the country was about to celebrate its independence from Britain and France. When I visit the tribe, Chief Jack brings the pictures out of his grass-roofed hut, his eyes beaming with pride. But there is sadness on his face, for as Prince Philip's 85th birthday approaches and Jack holds on to life in his 90s, he says time is running out. 'Before we go,' he says, 'I would like to invite him to the village, and there can be no better time than his birthday. He will be guest of honour and we'll roast pigs and bullocks for him. We'll cook him yams and celebrate with coconut shells filled with kava. All the girls will dance for him. But what about the Queen? 'Oh, she can come, too,' says Chief Jack, generously. 'After all, she has a big family like me.' He patiently lists his 13 children, 64 grandchildren and countless great-grandchildren. 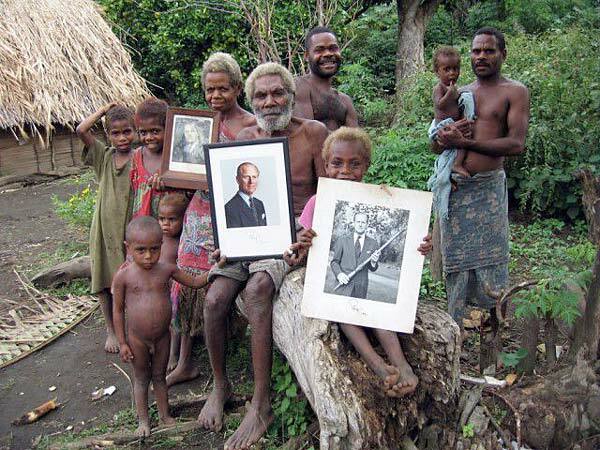 Simply background divine: Prince this Philip's amazing pose relationship between the Prince and this remote tribe is equally bizarre and stretches back to long before Vanuatu, still a member nation of the Commonwealth, shook off its joint European masters in London and Paris in 1980. Some time in the very distant past, so the legend goes, a mysterious stranger in a long, flowing cloak appeared on Tanna proclaiming that one day the active volcano on the island's east coast would burst its sides and gifts would fall down to earth. Then, during World War II, in the Pacific, refrigerators, cars and boxes of food did indeed float down onto the island — on the end of parachutes dropped from aircraft and destined for U.S. troops on the ground. But all the islanders remembered the cloaked stranger's promises, and using a name popular among the U.S. troops, the tribes began referring to him in their pidgin English as Jon Frum (Jon From) America. with religion a war grew club up is treasured the by name, its followers known as cargo cultists, and it spread as far west as Papua New Guinea. Today on Tanna, adherents are known as the Jon Frums. Chief Jack's tribe is a C splinter group from the Jon Frums, but they share the belief that goods — cargo — will one fall from the sky, bringing wealth to everyone. The Yaohnanens believe that Jon Frum had a spiritual brother who lived in the volcano but later emerged to take the form of a white man and move far away, before marrying a very powerful lady. But how on earth did this isolated tribe weave London and British royalty into their beliefs? Like all good legends, the answer is shrouded in the mists of time. But it seems likely that decades ago the the tribesmen Yaohnanen, right stories of Britain and the Royal Family by British government representatives who made occasional contact with the village. They fitted these new 'great people' into their traditional beliefs, and the legend of Philip as their god was born. Imagine the delight of Chief Jack in the early 1970s when, as a mere warrior, he was one of the paddlers in a war canoe that greeted the Royal Yacht Britannia when the Prince and the Queen visited the New Hebrides. But while Chief Jack and his fellow warriors were delighted to see the Prince, the tribesmen were very unhappy with the British administration. In time, John Champion, the Resident British Commissioner, discovered why. Years earlier, another Resident Commissioner had been entertained at a magnificent feast in the village and had been ceremoniously presented with the most treasured gift: a pig. He left without giving anything in return — a great slight — and, as Mr Champion was to recall later, 'this lack of courtesy had rankled ever since'. As a result, Mr Champion wrote to the Palace, explaining the tribe's belief that the Duke was Jon Frum's brother — and a god — and that a signed photograph might settle the old hurt. When the signed photo duly arrived, it was, he recalled, received with great dignity and satisfaction. As a thank-you, the tribe sent the Duke the war club and the request for another photo showing the Prince holding it. In 1980, the new picture arrived at the village and was presented in great secrecy to the former headman, Chief Kalpapung, by the last serving British Royal Commissioner of the New Hebrides, Andrew Stuart. THERE were riots and rebellions throughout the island at the time — some against the British, some against the French — but the Yaohnanens stayed out of it, and British diplomats wanted to believe it was because of the Duke's gesture. In a fitting tribute, Mr Stuart wrote in an official summary of his days on the islands: 'Yaohnanen's people have a gentlemanly naivety at which it is too easy for sophisticates to sneer. But there are uneasy rumblings in the village now, as the tribe's patience is tested. Where is Prince Philip? Why doesn't he come? There was great excitement last October when the news reached the village that the Queen was heading their way. Alas, it was a terrible mistake. It was not the Queen who arrived in Tanna but her baton, on the way to the Commonwealth Games in Melbourne. The Yaohnanens are only just getting over their disappointment and still they wait for word from the Palace. And the word is that the Duke of Edinburgh will not be celebrating his birthday on Tanna. A spokeswoman for the Prince says he has commitments in the UK next weekend and will be marking his birthday privately. There is further bad news for the tribe — the Palace says the Duke has no plans to visit Tanna in the near future. So Chief Jack will probably die without seeing his 'Messiah'. However, the tribal elder has plenty of sons — and Prince Philip has three of his own — so there is always the possibility of a tribal gathering of royals and warriors in years to come.